A well-kept interior can make or break a potential resale of a vehicle. It can also leave a bad impression on a customer driving a rental car. Maintaining and repairing a car’s interior extends the lifespan of the vehicle and makes the driving experience more enjoyable. Dent Wizard’s interior repair services provide an affordable solution for automotive businesses that rely on well-maintained vehicles and fast, SMART repairs. Businesses trust Dent Wizard technicians to complete a variety of interior vehicle repairs because we are the world leader in automotive reconditioning. 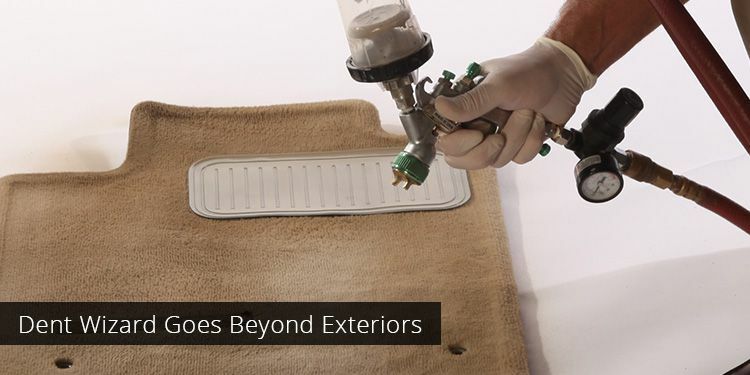 Our trained team of interior repair technicians utilize industry-leading techniques and take advantage of the newest interior repair technology. Quickly and affordably repair leather rips, tears, and holes that may be adversely affecting vehicle resale value. Learn more. Dent Wizard technicians provide seat repair for vehicle seats with tears, holes, rips, and burns. Learn more. Dent Wizard technicians repair scuffs, tears and holes in your vehicle’s vinyl upholstery. Learn more. Bring a vehicles carpet back to life with automotive carpet dyeing and repair by Dent Wizard. Learn more. Repair cracked or damaged dashboards and consoles with Dent Wizard's trained technicians. Learn more.